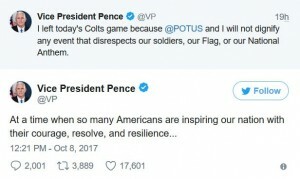 Yesterday, Vice President Mike Pence walked out of the Indianapolis Colts – San Francisco 49er’s NFL game when members of the 49ers team knelt during the playing of the American national anthem. 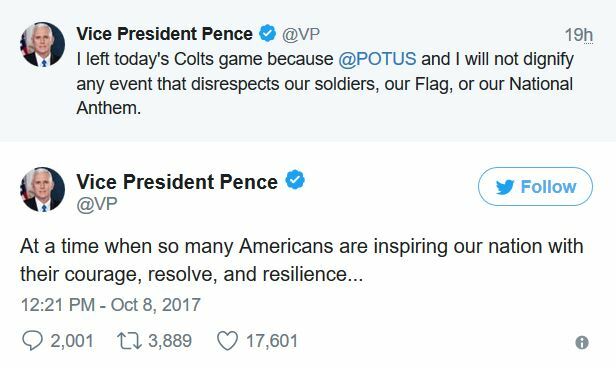 Pence tweeted, “I left today’s Colts game because President Trump and I will not dignify any event that disrespects our soldiers, our Flag, or our National Anthem.” This is a position that an overwhelming majority of Americans and even more NFL fans agree with as well. Of course the liberal MSM, all they can say is that this was pre-planned. Really, it was planned, that is all you got? Mike Pence was the former governor of Indiana and was scheduled to be there long in advance for Peyton Manning and his ceremony. If 49er players acted a fool and knelt for the anthem, of course Pence had every right to leave. Guess what, if the 49er players decided to respect the Flag and the Country, Pence would have stayed. Several San Francisco 49ers players kneeled for the anthem on Sunday in Indianapolis. Hw brave of the MSM, they interview 49er fans as to their reaction. How comical. A note to the moron 49er player Ed Reid who stated, this is what systemic oppression looks like. Grow up you fool. No you frigging idiot, this is what freedom of speech looks like. To the ignorant Reid, it looks like a PR stunt? Really? One might say your kneeling is a PR stunt, hmm? What the ignoramus Reid and the NFL is about to learn in a real way is that Americans have free speech rights too and that is they can walk out on the players and the NFL. For every action, there is a reaction. Ed Reid and your ilk, you foolish and misguided, entitled players are not the only ones that are afforded Freedom of Speech. 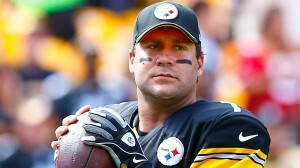 We have the right to boycott you and the NFL and we will. “I personally don’t believe the Anthem is ever the time to make any type of protest,” the Super Bowl-winning QB says. The NFL team was the first of three to not come out for the pregame ritual. In the end it is about respect for having the privilege of living in a country that provides so many liberties and freedoms and for all those who have paid with their lives for our freedoms. It is unfortunate that so many millionaire athletes who have benefited from those freedoms disrespect the very thing that has given them everything.